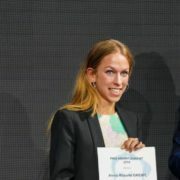 The 2018 Henry Dunant Research Prize is awarded to Ms. Anna Greipl for her LLM paper ‘International State Responsibility: The Role of Italy in Outsourcing Migration Management to Libya’. The paper discusses state responsibility in dealing with migratory flows by examining the role and responsibilities of Italy, notably on the basis of the 2017 Memorandum of Understanding between Italy and Libya which entrusts the latter with the authority to manage exit control in order to curtail migratory flows to Europe. ‘Besides the fact that this paper is extremely well researched and written, it also addresses a contemporary issue which affects thousands of the most vulnerable in the contemporary world’ underlines Marco Sassòli. ‘It, therefore, meets the price’s objectives to deepen, strengthen and renew the ideals and commitments of Henry Dunant’. This paper discusses International State Responsibility as an avenue to held States responsible when these outsource migration management to third countries. It offers an in-depth analysis of the role and responsibilities of Italy, focusing on the 2017 Memorandum of Understanding (MoU) between Italy and Libya, which entrusts the latter with the authority to manage exit control in order to curtail migratory flows to Europe. It attempts to demonstrate that Italy – by eliminating any territorial or physical contact between refugees and migrants and its authorities – cannot divest itself from its liability for the human rights violations refugees and migrants are subjected to in Libya. To approach the subject of this study properly, the paper starts by elaborating on the human rights context for refugees and migrants in Libya. Secondly, it examines the nature and the scope of the MoU establishing the cooperation between Italy and the Libyan authorities in view of restricting the access of refugees and migrants to Europe. The text portrays the baseline of the Italian-Libyan migration policy and helps to assess the degree of assistance Italy provides to Libya. In a third part, it addresses the direct legal implication Libya’s exit control measures established by the MoU have on refugees and migrants’ rights in Libya. It finds that the Libyan operations designed to prevent refugees and migrants leaving the Libyan territory in order to reach Italy’s jurisdiction are by their very nature infringing their essential human rights. On the one hand, international human rights treaties create obligations to refrain from contributing to the violation of human rights. But on the other hand, the current state of the law poses an insurmountable obstacle to extend human rights treaties to cases where no ‘effective control’ over the territory or the person can be established. In light of this, the final part of this paper examines Article 16 of the Draft Articles on Responsibility of States for Internationally Wrongful Acts (ASR) as an alternative avenue under which States may be held liable for the aid and assistance they offer to States committing human rights violations. In fact, it finds that Italy may still incur indirect State Responsibility for the aid and assistance it offers Libyan authorities, pursuant to Article 16 ASR. Anna Greipl holds a bachelor’s degree in International Relations from the University of Geneva and a master’s degree in Law and Politics of International Security from the Vrije Universiteit Amsterdam. Developing a particular interest for the fields of international humanitarian law and human rights law, she chose to pursue with the LL.M Program at the Geneva Academy and graduated in summer 2018. In the past, she worked for the Deutsche Gesellschaft für Internationale Zusammenarbeit (GIZ) in security reform activities in Cameroon. Currently, she works as an Associate with the Legal Division of the International Committee of the Red Cross.